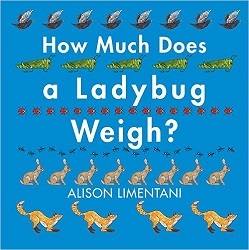 ﻿ Sonderbooks Review of How Much Does a Ladybug Weigh? Review posted March 18, 2017. Boxer Books, 2016. 28 pages. The more I look at this book, the more I like it. Right now, I’m planning to use it for my next Toddler and Preschool Storytimes, and even bring it to Kindergarten and first grade classes for booktalking. The idea is simple, but it’s got so much depth. 10 ants weigh the same as 1 ladybug. 9 ladybugs weigh the same as 1 grasshopper. 8 grasshoppers weigh the same as 1 stickleback fish. 7 stickleback fish weigh the same as 1 garden snail. 1 swan weighs the same as 362,880 ladybugs. The illustrations are simple and clear. This whole book could almost be thought of as an infographic, except that the animals are not icons, but detailed illustrations. I love that the animals chosen are not your typical animal-book animals. But most of them (except maybe the stickleback fish) are ones a child is quite likely to see in their own yard or neighborhood. I love the way this is a counting book, a math book (about relative weight and even multiplication), a beginning reader, and a science book (about these different species). It’s also a beautiful picture book. The note at the front says, “The illustrations were prepared using lino cuts and litho printing with digital color.” They are set against lovely solid color backgrounds, so the animals show up nice and clear. I have a feeling that reading this book frequently with a child will get that child noticing small animals and insects in the neighborhood and thinking about weights and differences and good things like that. A truly brilliant choice for early math and science thinking.